In the 21st Century, the landscape of retirement is changing. People are living longer and retirement is no longer thought of as a destination, but as a transition: with an ending, a period of unknowns and a new beginning. It’s important for people to think about what they are retiring TO rather than just what they’re retiring FROM. It’s hard enough for an individual to deal with these retirement transition years, and can be even more complicated for couples who may have differing ages, energy levels, priorities, values, goals and dreams. It may also feel like a challenge for the adviser to work with a couple as the client. 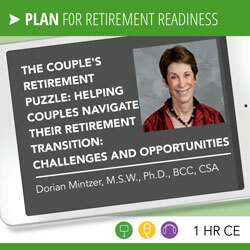 Using the framework of “The Couple’s Retirement Puzzle”, this webinar will help advisers understand some of the important conversations couples need to have, to develop tools to help couples better communicate with each other and to develop a vision for the years ahead, and to understand some of the challenges and rewards in helping couples have these important conversations. Understand some of the challenges and rewards of helping couples have important conversations. This on-demand webinar is a recording of a recent live webinar. Check our WEEKLY REBROADCAST SCHEDULE where there is no need to take the online quiz to receive CE. You may also take this on-demand course any time for 1 hr CFP®, CRC®, and other Continuing Education Credit when you pass the online quiz. Your presenter is Dorian Mintzer, M.S.W., Ph.D., BCC, CSA. Dr. Dorian Mintzer is an experienced speaker, coach, therapist and consultant who weaves adult development, holistic life planning and positive psychology into programs that tap and shape clients’ energies into roadmaps for wiser, more enhanced living. She is co-author of the award winning The Couples Retirement Puzzle: 10 Must-Have Conversations for Creating an Amazing New Life Together, co-producer of The Career Playbook: Second Half Playsand has contributed to a number of other books such as Live Smart After 50!, Not your Mother’s Retirement, 65 Things to do when you Retire, 70 Things to do When you Turn 70, and 80 Things to do when you Turn 80. 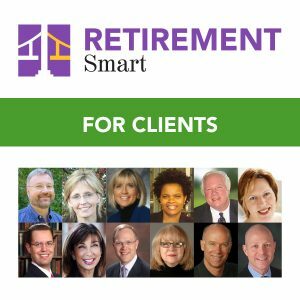 She is host of the popular monthly Revolutionize your Retirement Interview with Expert’s Series. She’s been featured in a variety of media such as the NY Times, WSJ, USA Today, CNN Money, Forbes.com, Next Avenue, NPR, ABC Evening News and the Today Show and has given a Ted X talk focused on “Embracing your Bonus Years.” Learn more about her and her programs at www.revolutionizeretirement.com. (dorian@dorianmintzer.com). Not familiar with on-demand courses? We help you be sure you’re comfortable navigating our on-demand system. Just contact our customer service department by email anytime or by phone 847.686.0440×105 during regular business hours. What if you decide you need more than one course? Then become a subscriber! Just notify us that you want to become a subscriber within 10 days of course purchase to apply the cost of your individual cost to a new subscription. We know that you will be pleased with your purchase of this product. 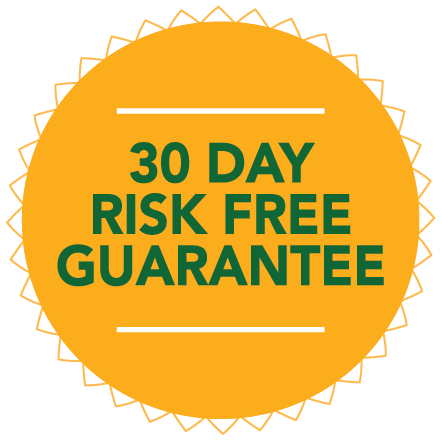 If, however, you are not completely satisfied notify us within 30 days of your purchase to receive a full refund of your fee. All financial roads lead to retirement. Invest in your expertise.